FITS AM-20 PASSENGER CAR REARS ONLY. IT DOES NOT FIT JEEP REARS. Eliminate your troublesome stock 2-piece axles with DoctorDiff ONE-PIECE, CUT-TO-FIT 29 spline axle shafts. Shafts are back oxide plated for corrosion resistance. 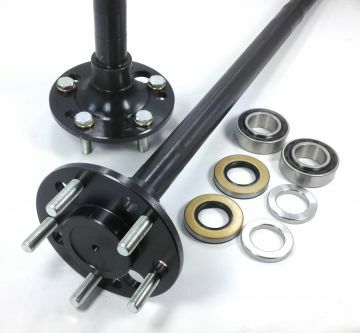 Axle package includes 2 1541 high-strength shafts with 1/2" x 2" lug studs (installed), 2 Green sealed ball wheel bearings (shipped loose), 2 lock rings and 2 inner seals (shipped loose). Cut-to-fit shafts measure 30" (overall length) with 5" of spline which must be trimmed with a chop-saw to the desired length. REMEMBER, THESE AXLES ARE MADE LONG TO FIT A VARIETY OF AM-20 PASSENGER CAR REARS. YOU MUST CUT THESE AXLES YOURSELF WITH A CHOP-SAW! Measure your original axles from the outside edge of the wheel bearing race (closest to the wheel flange), to the outside edge of the spline. Transfer this measurement to the new shaft, starting at the inside edge of the bearing journal (the step where the wheel bearing presses against) and cut to length. You must measure BOTH axles. Because the brake backing plate doubles as a wheel bearing retainer, you must slip the backing plate over the axle shaft BEFORE pressing the wheel bearings and lock-rings on. Press wheel bearings tight against the axle journal with "RW903CJ" lettering facing AWAY from the axle flange. **I recommend removing the differential center thrust block, as this is not necessary and it can interfere with axle installation and wheel bearing longevity. ***If your vehicle is equipped with a power-lock (2-piece/bolt together) clutch style twin-grip posi, I recommend cutting the axles 0.1" longer than stock, for maximum spline engagement. Because of this, you MUST remove the differential thrust buttons. This involves removing the differential, so you can drive the roll pin out that retains the thrust buttons.